This year’s programme is A4 in size and 48 page long - printed in full colour on heavy art paper. The design quality is superb. 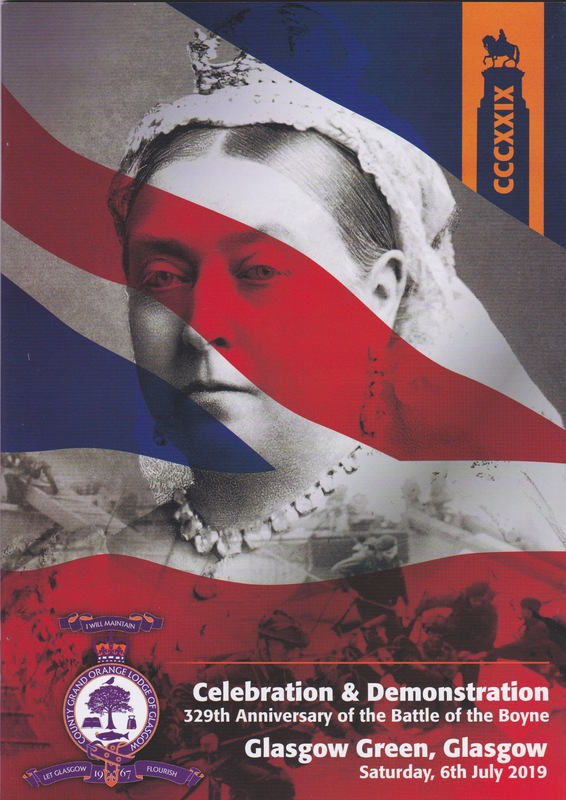 Articles include pieces on the Orangeism’s place in Glasgow city life; Ruth Dudley Edwards exposes the IRA campaign against Orange parades in Ulster; King William’s landing in England; on Queen Victoria; Robert Burns; Orange history and the Orange contribution in the two World Wars. A lot of great reading. My lodge has some spare copies which you can purchase using the links below. The programme costs £2 plus the postage depending on where you live. Sadly UK postage costs are high and Paypal take a cut too. Ordered two pick up next meeting. Always get one for an old dear neighbour, loves them. Ordered, sounds like an excellent read. Whoooo! Sales have been great - first batch will be posted this afternoon. I will get mine at my next meeting. Always a good read and some well researched articles in it. It's improved a lot in recent years.